A Peaceful Sanctuary is a beautifully renovated 1928 farmhouse located on an acre of land, nestled in a 60 yr old walnut grove. We are a working farm with Alpacas, chickens and 3 small rescue dogs.. Since we are a working farm raising and selling chickens it does require us to be here to do farm chores and take care of the animals. We will be happy to try to work around your schedule to give you your privacy. Please feel free to talk to me. We are conveniently located 1 mile off I-5 exit 195A on the Eugene/Springfield border. Just 4 miles from the Uofo A Peaceful Sanctuary is perfect for traveling nurses being 5 minutes from McKenzie-Willamette and walking distance from Riverbend Hospital. Great for visiting family, business meetings, vacations, Duck Games, Graduations, romantic getaways and as an extended stay. Each morning (when available) you will receive freshly laid eggs by our hens who are naturally fed and free range. Winter we do not always have eggs. A Peaceful Sanctuary sells naturally fed chickens and eggs. Our hens are fed feed with the main ingredient being peas grown in Oregon with no soy/corn or GMO's. We have our own laying hens as well as raise chickens for sale. 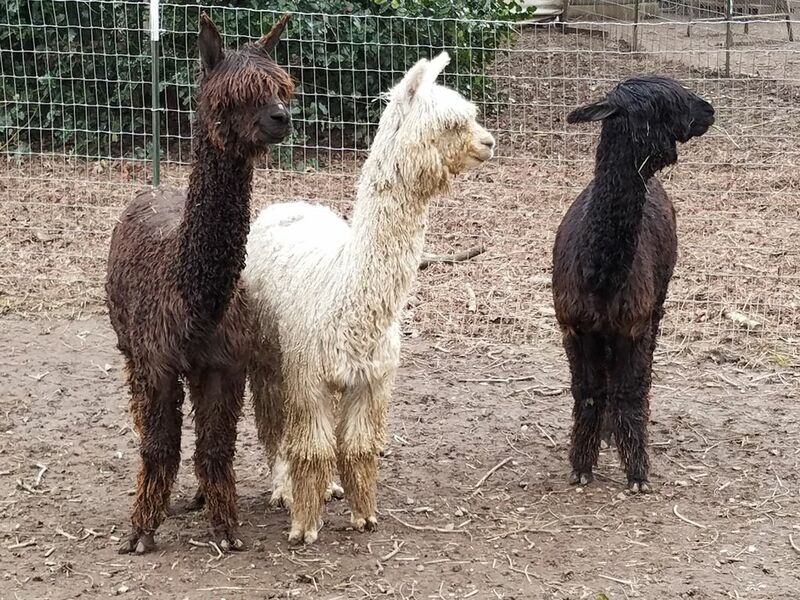 On our farm lives Fozzie, Frankie and Phantom our Alpacas, a magical kitty named Merlin and our rescue Chihuahua's 'Livie', Pepe and Harper. The farm and animals offer wonderful, heart warming experiences for children and adults a like to carry with them a life time. How could you not fall madly in love with an Alpaca who gives kisses for carrots? Children are always welcome to help me with farm chores, taking care of the animals and collecting the eggs. Please note the house is not child proof may not be suitable for toddlers and very young children. If you never have had the experience of being with an Alpaca you are in for a treat. They are the lovers not fighters. My Alpacas are sweet, friendly and passive creatures, guaranteed to melt your heart. Come treat yourself to total comfort by sleeping on 650 thread cotton sateen sheets and top of the line queen sized beds, one pillow top and the other firm. Each bedroom has new 32' flat screen TV's with Comcast and Showtime, plus air conditioning, high speed internet and wifi. The kitchen is fully equipped as well as a washer and dryer. Much of the house is decorated by local artists work and antiques. The home with two bedrooms, is minutes from The UofO,The Saturday Market, Autzen Stadium Duck games and The Hult Center. The shuttle bus to Duck games is across the street and is the best way to travel to the game. We are close to a mall, theaters, post office and many restaurants, some walking distance away. Located in the Willamette Valley, we are only an hour to the coast and the Cascade Mts. We are on the edge of town, with the city on one side and the wilderness on the other. It is not located out in the country we are a working micro-farm in the city. With the city growing most places around town are a short drive. Our farm faces the beautiful Coburg Hills and the crystal clear McKenzie River is a 5 minute walk. Swim and raft the River or take that leisurely stroll and watch the river flow. Check out A Peaceful Sanctuary on Facebook and like us! PLEASE CHECK OUR CALENDAR BEFORE CONTACTING US. MY CALENDAR IS ALWAYS KEPT UP TO DATE SO YOU CAN SEE MY AVAILABILITY BEFORE CONTACTING ME. It is my intention in opening my home for rent to offer comfort, bring happiness to people and make magical memories for children they will carry with them for a lifetime. Life is so challenging for many especially now. It is my way of creating a business that is green, brings peace to people and gives back to the community. The reason I chose to buy my house in this location was because of the beautiful land, views and very quaint, homey house and walking distance to the McKenzie River. It was a happy home with 11 children being raised here and you can tell there was a lot of love. We are a mile off I-5 and 4 miles drive to downtown Eugene. The feel of out in the country but close to everything. You and your family get to experience farm life. We are 1928 working farm nestled in an old Walnut grove with very old vegetation and flowers. There are hummingbirds that feed daily and live here year round feed. The birds feed off feeders just a few feet from house. We are a 5 minute walk from the beautiful McKenzie River. Table, chairs and love seat under a big leaf maple canopy of shade. The Alpacas pasture is right there so you can feed them carrots. You will be staying on a small working micro farm and are free to collect the eggs, roam the farm to feed the Alpacas, goats and chickens. We are a 5 minute walk to the beautiful McKenzie River. On Thursdays (seasonal) you can walk behind the property to the organic youth farm. Our new project this last year was bees. You are welcome to observe the bees making the combs and honey in our pasture. What a peaceful and charming place to call "home" for our time traveling in Oregon. Pam is an amazing host- she is always available and goes above and beyond to make sure your time here is very comfortable and enjoyable. The sweet animals on the farm are so much fun to watch and interact with and the fresh eggs are quite tasty. The house is beyond comfortable with everything you could possibly need and the beds make you never want to leave. The location is perfect, close to everything yet still provides that "country- like feeling", and a short walk to the river will live you feeling refreshed and rejuvenated. A great home base to explore all that this area has to offer, from hiking and camping, to breweries and wineries. A huge thanks to Pam for sharing her home, animals and plentiful knowledge about Eugene. We would definitely recommend this peaceful sanctuary to anyone! It's been a pleasure having you and Kris stay at the farm. You are great guests! I appreciate you offering to help with the animals and looking forward to showing you how to trim goats hooves. It's so rewarding to have guests stay at the farm that want to learn about sustainable farm life and to learn about caring for my animals. It's been new adventures for us too taking my dogs and yours on a pack walk. I am happy you are enjoying your stay. Thanks again you are amazing!! We had such a wonderful time at Pam’s place. Fresh eggs in the morning, crisp white comfy sheets, friendly animals and an overall peaceful vibe. I loved spending time reading in the garden and our walk at Fall Creek state park was rejuvenating. Her place is close to everything! I would recommend Pam’s rental to anyone looking for a peaceful respite. Thank you for the nice review Beth. I appreciate and treasure my return guests. It was great to see you both and to go hiking with you was a treat. See you next year! just 3 days. but so relaxing. small farm life at it`s best. the alpaca`s are a trip. plenty of local activities await, hiking, the river just a block away. not to mention local restaurants. my wife and I will recommend it to anyone. pam does a great job of taking care of the property and her guest`s. Thank you for the nice review. You and Karen were such great, fun guests. I appreciate you inviting me to hike with you and having a barbecue at the farm. I'm glad you had such a nice time and got to experience some of our beautiful parks and hiking trails. Hope to see you again soon..
Five of us stayed comfortably in this really charming house surrounded by animals! It is in the perfect location, close to stores yet you feel like you are out in the country with the river just minutes away. We enjoyed checking out the town, floating on the McKenzie, and hanging out in the yard (which truly is a peaceful sanctuary). The alpacas are amazing, so friendly and sweet, we fell in love with them all. We also got to meet the goats, collect eggs from the chickens, and hand out with the dogs (three of the most well behaved chihuahuas you will ever meet) and Merlin the magical cat. Pam was great about letting us tag along to check out her animals and making sure we never ran out of eggs. We are already planning to make this a yearly thing! It was great having you ladies stay at the farm. I am glad you had such a fun time. My alpacas sure loved all of you. Thank you so much for the framed print and table decoration. I hung the print on the wall of fun. Thank you for staying with us. See you next year. Lovely stay at the farm! Pam was kind and helpful and we loved visiting with the animals. Wonderful! Relaxing and so close to everything! Thank you Pam. It was so nice to have you and Mike stay at the farm. I am glad you enjoyed your stay. Hope to see you again soon. Our rates are for 4 guests staying at the farm. Over 4 guests an additional $5.00 per night for kids and $10.00 for adults per night. Rates for Duck Games are $150.00 per night. One night minimum We have 60 day cancellation policy. Any cancellations less than 60 days before arrival the security deposit will be refunded. VRBO has cancellation insurance. We also book the farm month to month (some dates may not apply) $1950.00 per month. This includes farm rental, electric, cablevision, WIFI and trash and recycling service. Monthly rentals require us talking on the phone first. No automatic bookings for long term without approval of owner.